As you may have realized from my earlier comments, the villas here are all fully staffed which typically includes a butler, cook, maid, and gardener. Some villas will have more depending on the amount of guests that they accommodate and the level of service that they strive to provide. 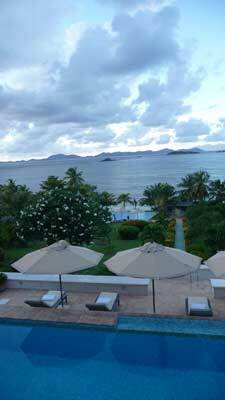 And let me say here that the people we met on Mustique were all wonderful, kind, and friendly. They make visitors feel so welcome and are a real draw for this island paradise. As for the staff, they are all true professionals who take pride in the villas and the guests who frequent them. Many guests return annually and mostly to the same villa where they have grown to trust and value the people that work at the villa. It was such a pleasure to walk into many of the villa kitchens and see that the staff had bulletin boards with photos of the villa families from over the years. Mustique has just a couple of options for dining out, so most guests enjoy their meals at the villa. The atmosphere of the villa certainly rivals that of most restaurants so you don't miss anything by staying in. In our case we were seated under the gazebo, poolside, with Frank Sinatra drifting through the air. We took both our breakfast and dinner at the villa both days and were treated to excellent meals. Both of our dinners started with homemade soups, the first a local callaloo recipe and the second a pumpkin bisque. 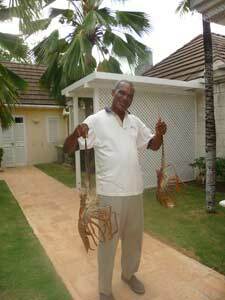 Our butler heads to the fish market to pick up the catch of the day for meals and our second night he made us grilled spiny lobster that was unbelievable! We all went to bed fat and happy that night. It's typical that guests will sit with their butler at the beginning of the week to plan out any special menus they desire, including picnics to be prepared at Macaroni Beach. There is a grocery store in town where guests can leave their credit card on file so that either the family or the staff can easily pick up provisionings as needed. When you are ready to dine out or meet up with friends for a drink, there are a few options. There is the Cotton House hotel which we didn't see since it was closed during the time that we were on island. We did have a very nice lunch at Firefly which offers a varied menu and is known for their pizzas which they will even deliver to your villa. There is a comfy bar area at Firefly where you can become part of the Martini Club...if you dare. Down the hill in the village is the famous waterfront Basil's bar and restaurant which has a reputation as a popular gathering place to watch sunsets and party into the night. We stopped in to watch the stars twinkle as we sat back and enjoyed some of Basil's fruity concoctions and a bottle of peanuts. Romantic Luxury: Villa MV JOL is a 5-bedroom villa fit for a princess. It is set on a private peninsula for perfect views and endless breezes. Villa surprise...a private plunge pool off the master bedroom. Family Cottage: Villa MV FIS is a 3-bedroom stone villa that has lots of beds for all the kids. The huge veranda is the perfect place for reading and playing games or for evening cocktails. Villa surprise...the only fireplace on the island. Seaside Living: Villa MV PHB is where classic design and modern elements mix in this Oliver Messel designed 5-bedroom house. The large modern pool is just steps from the beach. Villa surprise...an bamboo outdoor shower.